The same way corporations raise capital by selling shares, we offer you to be part owner of a hive, your return being honey and bragging rights. Buying an annual share of a colony is perfect for anyone interested in beekeeping but unable to keep bees on their property for different reasons. Shares are also great as a gift for friends and family. All shares expire yearly. You can purchase every year or request an automatic renewal of your shares. Do you sell more shares than hives available? No, we only sell shares to existing hives. What do you do with the proceeds of this program? We use most of the money to pay for equipment and bees for the hive that is adopted and to protect and care for the bees throughout the year. Additionally, we spend money on implementing and testing natural pest controls, continuing our beekeeper’s education (courses and books mostly), replacing tools and other needed equipment, etc. *Please note that we are not legally established as a 501(c)(3) or other non-profit organization. As such, contributions are not tax deductible. The main harvest is done in July, while a fall harvest may happen in September. We send the honey first to our shareholders, starting from those that own the largest amount of shares. Is there a limit as per how many shares can I own? No, as long as there are shares available, you will be able to purchase as many as you want. Every 12 shares you will own a full hive, which will give you additional benefits. We will contact you after your purchase is processed for next steps. Can I gift the shares to a friend or relative? Yes, you can name anyone you want on the shares, but notice that, if you are naming 3 people at 4 shares each, each person will own 1/3 of a hive and none will own a full hive. We will ship honey to the address of the shareholder, as long as it is in the lower 48 states (export regulations do not allow to ship honey outside of the country). Can I visit my hive? Of course you can. We have open house dates for our shareholders and you are welcome to reserve a place for a visit those days (as long as we have enough protective gear available). We will notify shareholders of the dates and times by email. Can I adopt a hive if I live outside of the United States? Yes, we will be happy to sell you shares on our hives if you live abroad, yet we cannot ship the honey to you. If you have a family member or friend in the US, we will gladly ship your honey to them. Is this like becoming a beekeeper? No, you are not really the beekeeper, we do that job for you. We take care of all of the beekeeping activities so that you don’t have to. However, we do keep you informed on how your hive is doing with a quarterly update letter. Why is it important that I help? As you know, without the bees, much of our food will be gone. Bees are facing serious challenges right now and most people don’t know what to do to help. The adopt a hive program is a perfect solution. Amongst other things, keeping bees requires funding and that’s where your help is invaluable. 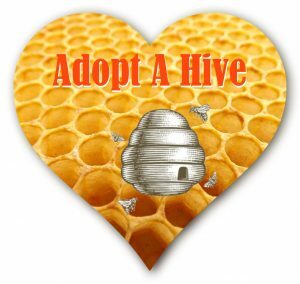 Your contributions allow you to sign up to be an adoptive parent to one of our beehives for one year. By becoming an adoptive parent, you help your adopted hive receive needed food, supplies, and treatments. Your help is, for that reason, invaluable in helping the honey bees. What do I have to do to adopt my hive? All you need to do is visit our online shopping cart system and purchase your shares. If I want to participate, will my private information be secure? Yes, your private information remains secure. We respect your privacy and will not sell your private information to other parties for any reason. Your payment information is processed through Paypal. We don’t collect or keep your credit card number.